Even though I’m no longer on staff, I’m glad that my former employer still hasn’t taken me off its mailing list. The quarterly Medical Staff Newsletter is a nice way to keep up with my former colleagues. I was excited to see that the hospital recently launched a new community outreach program. 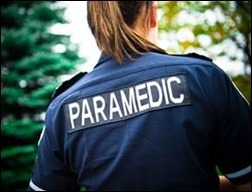 In an attempt to prevent readmissions, it uses paramedics with advanced training to perform scheduled home visits. Patients can be assessed for signs that their chronic health conditions are progressing are becoming unstable. The paramedics also provide disease management counseling. For an initial panel of pilot patients, emergency department usage was reduced by 67 percent. Since I work in a couple of different practices, I wondered how they are contacting the providers of record and whether we’d be seeing any communications in our EHR. Unfortunately they are using a standalone system that was designed for home health and it isn’t connected to anything but the hospital’s clinical data repository. The mode of communication to attending physicians: fax. I also chuckled at its promotion of staff physicians who appeared in the “Best Doctors” edition of a local magazine. The methodology used by some publications to create those lists is sometimes questionable and reminds me of a high school homecoming court election. People often vote for the names they’ve heard most often, regardless of personal experience or knowledge. Two of the providers on the list have been gone from our community for more than 18 months, so they’d be hard to refer to. Another one is retired. My favorite entry is a physician who has been disciplined multiple times and who sexually harassed me in the operating room. It’s bad enough that they were included on the magazine’s list, but I’m embarrassed at the hospital using them for marketing purposes. The newsletter also included the first communication I’ve seen about the new EHR conversion project. The vendor was officially selected in December, but planning has been kept fairly quiet. They’re still not saying which facilities will go first, but they’re at least warning clinicians that it’s going to take more than three years to complete the migration across all business entities. Although I wish them the best, I’m glad to not be fighting in that particular skirmish. A reader sent me this awesome ICD-10 countdown clock, which I’ve added to my personal website. As I continue my practice road show, I’m seeing people who are seriously worried about the crash of the revenue cycle as we know it. I’m thinking about making one of those construction paper chains that we used to do in elementary school as we counted down to holiday break. Tearing off a link each day as we march towards what some are describing as “billpocalpyse” might be therapeutic. One physician I trained today actually talked about provisioning a safe room in his house in case staff comes with pitchforks and torches when he can’t pay the bills. Although I think it was a joke, at some level I think he was actually consider it. Several readers wrote in about their ICD-10 training experiences. One works is tasked with helping clients navigate the transition. At a recent client forum, he describes comments that, “Most of the training that is out there is useless. The only content that had any agreement on whether it was not it was useful was CMS’s Road to 10 specialty content – specifically the coding scenarios for each specialty.” As a physician (and purveyor of training myself), I agree that scenario-based practice is essential. In addition to making sure they know how to code items that are on specialty-society or CMS lists, providers should also ask their IT staff to run a list of their top 10 or 20 diagnoses and practice coding those. If your docs haven’t done it, please make the suggestion. You’ll be glad you did. Another reader commented on my recent mention of electronic prescribing of controlled substances. Apparently Imprivata has a hands-free authentication solution, capturing the token code from a cell phone without requiring manual entry. I’m pretty sure we could get away with having phones as long as they stayed in our pockets. I’m definitely going to check it out and appreciate the tip because as much as I try to stay on top of new products and offerings, it’s impossible. As part of one of my ICD-10 engagements this week, I also presented to a group of physicians about Meaningful Use. Although we know a final rule for Stage 3 is imminent, many of my colleagues think it has become a big joke. I’m hearing from more and more that they’re willing to take the penalties just to regain control of their practices. Of course I’m not hearing that from physicians who sold out to large health systems or to hospitals – they’re stuck with whatever is handed down. Many organizations have already budgeted the incentives and planned not to incur penalties and don’t seem open to altering the future balance sheet. Have you opted out of Meaningful Use? Email me.